In today's world, Large Format Printing is used all around us. It seems that the theory "the bigger, the better" seems to pay off in the Advertising world. If you take a stroll downtown and look at the Advertising, you will notice how many companies are taking advantage of Large Format Printing. Surely, your business will need large printing as well to get noticed - but which Large Format Printing method is best for you? Well, have no fear! Above all Advertising, Inc. is here to educate on the secrets of the Advertising Trade. Let's take a look at some of the most common large format printing, and how they can benefit your company. 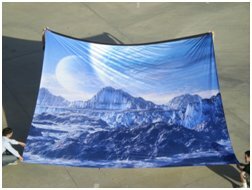 Our Large Fabric Prints are done using our Full Bleed Dye Sublimation printing method on a polyester blend material. The print is infused into fabric instead of being applied on top, so the print will not crack, fade, or peel under normal use. These are 100% customizable so we are able are able to meet whatever size, shape, or design you are looking for. Our Large Vinyl Prints are very popular. 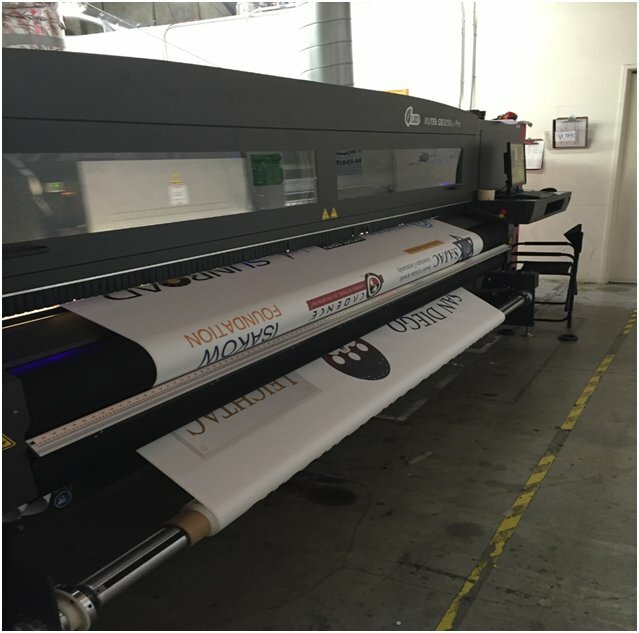 We direct print the ink onto the top of high-quality, heavy duty vinyl. We are able to accommodate any size or shape Vinyl Print you may need! These are available with a hem and/or grommets, depending on what your needs are. The ABA-Tex™ Prints are one of a kind! This material is removable, reusable, and repositionable. It works great indoors and outdoors in all weather conditions. It is easily removed and repositioned or even reapplied to another surface without leaving any sticky residue. Mounting this on any flat surface is extremely easy and very forgiving if you make a mistake. We can print large or small advertising prints and they are customizable as well! Our Rigid Sign Prints are our most cost efficient forms of Large Format Printing. Depending on your preference, we can use Coroboard or Foamcore materials. The Coroboard material is fluted (also known as I-Beamed), while the Foamcore is filled with foam in the middle. We offer these with single or double-sided imprint. This form of printing is offered with a high-quality full-digital imprint in any size up to 4' x 8'. To get appropriate pricing on these customizable pieces, contact your sales representative with the image you want printed, the size and quantity of your intended purchase.